Most people love animals. They love to keep birds, dogs and so on, but not everyone can look after animals. If people do not want to keep animals, it is not because they have no compassion; it is perhaps because they do not have the time or experience, or possibly the environment does not permit. For instance, some people's houses are too small. So we still need to consider whether or not we are suitable to care for animals. We don't have to own animals to show that we have compassion. If we cannot house animals, we can still continue to support animal protection groups, or spread the message of loving the animals. This is also very helpful. If we have the chance to adopt an animal, say a bird, for example, then we should be mentally prepared. We have to find out what kind of bird has better affinity with us. We have to study books and decide what kind of bird we like, what conditions are needed for adopting the bird, and what we need to do. We should check and see whether we can do all of these. It is not enough to just bring animals home and feed them. Every day, we have to take care and communicate with them in the same way we treat our beloved friends or relatives. This is what we should do. Only when we are able to do this, then the animals can live happily, because they also have deep feelings. They are very faithful and sentimental, and they treat their human caretakers like their own family. Besides that, we have to scrub and clean their cages every day and take them out to play. If you cannot do that every day, then at least do it once every one or two days. However, you must communicate with them and talk to them every day. It is all right if you cannot communicate with them on the inside; just talk to them in English or Chinese; they can understand perfectly. Give it a try! (Master and everyone laugh.) Suppose you have a bird. It is all right if you cannot communicate with him every day in the way I do. Just treat him with love and he will feel it. The more loving you are, the more you are able to communicate with the bird, and naturally you can understand each other very well heart to heart, as distinct as human conversation. The same applies to all animals. If we want to communicate with them, sometimes their language is different from ours, so we really need to have love to understand them. So, do not worry that your animal cannot understand you; just worry that you don't understand them, but slowly you will understand. Actually, we don't have to use language to understand each other. We all have the telepathic ability within. After living with animals for a longer time, this telepathy develop gradually. When you sincerely want to understand the animals, this dormant spiritual quality will naturally emerge. I never learnt any technique of communicating with birds; it revealed itself spontaneously. When you have love, it will transcend all languages, and you will understand each other more and more. If you are caring for animals, sit together with them on some quiet nights, try not to think about anything else, and ask the animal from your heart: “Can we try to communicate with each other?” Then you will be surprised to find that he or she can communicate with you, not with language, but through telepathy, very distinctly. If you really cannot do it, suppose you are too busy and cannot quiet down, and you cannot get your telepathic ability to emerge naturally, it is all right. We don't need a lot of words. Just look after the animal like you are taking care of yourself, and then you will feel from within that you understand each other. Actually birds and dogs do not demand much; you don't need to talk to them a lot every day. 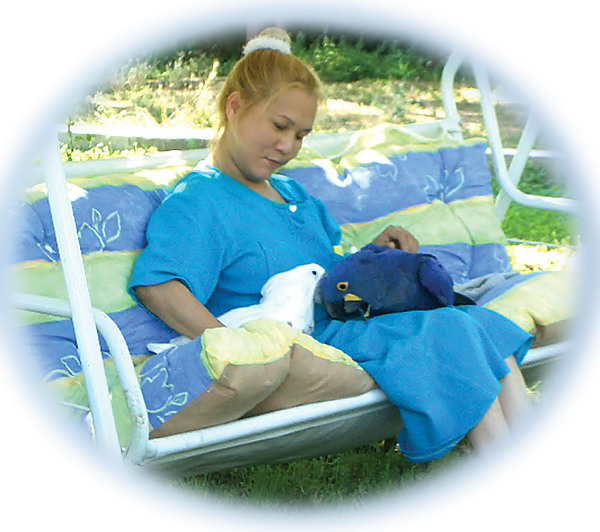 I also do not communicate a lot with my birds every day; we just treat each other with love, and that is enough.